These Ambassador POD covers are hard-bound, leather-like, textured covers with an added feature—a self-adhesive label which you can personalise by digitally create print your own design and then paste the finished label into the embossed frame of the cover. Ambassador Print On Demand Covers are suitable for serious presentations, as well as customised gifts. The Ambassador POD is available in the standard two colours – Black and Navy Blue. However, for certain large quantities, other skin colours are available. The following Bindomatic document binding machines can all bind the Ambassador Covers – the Accel Ultra, Ultra+, Cube and Flex. 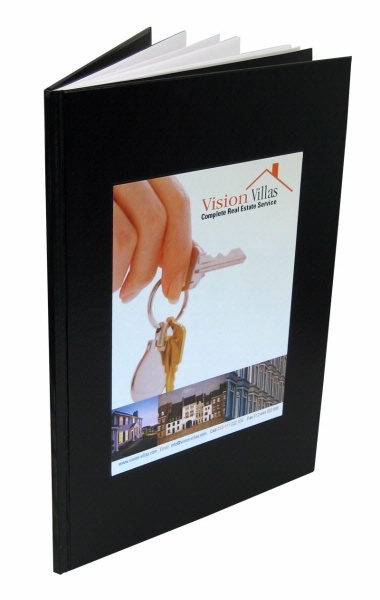 Leather style textured surface on 2.5 mm thick rigid cardboard with color matching paper on inner sides. 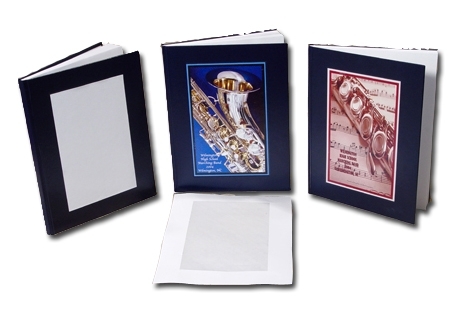 A4 format with die-cut peel-off that fits the embossed area on the cover. Printable on any digital colour printer. A4 portrait size as standard - other formats available on request and minimum quantity. Spine widths from 3 to 48 mm. Up to 480 sheets 80GSM paper. Ambassador comes up to 20 covers (for 3, 6 & 9 mm) down to 4 covers to a box (for 48 mm). Durable EVA adhesive glue strip with embedded book binding fabric, specially designed by Bindomatic.